Qi Sword is a further practice to tune in to the cosmic Qi (energy and information), the sword provides us with the medium to do healing, perform arts and receive spiritual inspiration. Hua Gong is a way of tuning in to the cosmic Qi (energy and information) with which we can do healing, perform art and receive spiritual inspiration. There is an integrated quality to everything we choose to do based on the practice. Any method in Hua Gong embodies three aspects, healing, arts, and spirituality. The healing invoked by the sword is achieved through a cosmic channeling, or tuning into the cosmic Qi. We experience cosmic forces empowering and guiding us to move and we only need to respond to it. In other words, the sword moves by the Qi, not because we move it. As a way of getting through to the cosmic Qi, the sword is a symbol of the masculine, or Yang energy. It expresses strength, uprightness, and the spirit of martial arts. It is “cool” to use a trendy expression. In the Art of Expression Hua Gong retreat some years age, many practitioners experienced or witnessed the powerful effects of the sword. Merely holding it alone enabled one to feel the powerful vibrations coming through the steel, and trying to hold the sword stable and still was difficult, one had to move with it. Then came the physical movements of the body. It should be noted here, that though the art of the sword is impressively beautiful, it is not necessarily so at the beginning. It is difficult to just control the sword when the Qi is coming through strongly. It can be overpowering. This is where the healing function is initiated. To be able to move artistically, and beautifully we have to open ourselves at a deep level. Our Qi channels have to open and our tendons and ligaments have to transform. Our body has to coordinate and readjust. Moving with the sword, our system becomes balanced, our body becomes supple and our strength increases. Mentally we feel more confident, upright and fearless. So the Sword Play Hua Gong is a perfect combination of art and healing. This retreat can be taken in two ways. You may observe the swordplay, and this is a powerful way of receiving the Qi healing as many who have witnessed this will agree. Everybody should be able to benefit in this way. 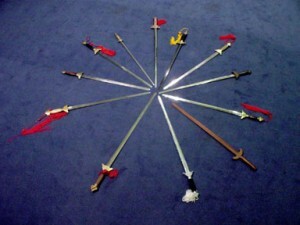 Learning to do the swordplay in this context will depend on an individuals learning abilities. However Hua Gong is a way of learning itself as well as a way of practice. So one learns at a more rapid pace than usual, as the Qi leads toe way. A sword, metal is preferable to conduct the Qi, and as usual a cushion, blanket and comfortable clothing are recommended for the Qigong practice.